Also featured on Phillies Nation. The Phillies are in a good situation; they have six starters, but five spots. Many teams wish they were on the same stage, but somebody must go. The only question is, who? J.A Happ has made his case to stay in the rotation, coming off a complete game shutout. The young lefty is a legitimate Rookie of the Year candidate, posting a 2.74 earned run average in 115 innings. With an 8-2 record, he has given up 1.12 walks and hits per innings pitched. Opponents are batting .222 against him. There is no doubt Happ deserves a spot in the rotation, but he could find himself in the bullpen, where he started the season. He has a 2.49 ERA in relief this season. The more Pedro Martinez pitches, the better he gets. Last night, he struck out 11 batters in six innings in a rehab appearance with Double-A Reading. He gave up two earned runs and threw 59 out of 83 pitches for strikes. The way he is progressing, the future Hall of Famer will bump somebody out of the rotation. The easy target is Happ because of his bullpen experience, but why not Jamie Moyer? We all love Moyer, just not the way he has been pitching lately. He has ten wins, but that further shows the flaws of the win-loss stat. His ERA is 5.55 and his WHIP is 1.47. It is predictable as to what teams he will succeed against: young, free-swinging clubs like the Florida Marlins. Any other team is trouble. The Phillies have to do what is best for the team, not what is "right" or the "classy" thing to do. Taking Moyer out of the rotation would not be fair for the 46 year old, but the Phillies need to do whatever it takes to win. Yes, Moyer acts as a pitching coach to young pitchers, but he has struggled. Baseball is a business. Would Happ strengthen the bullpen? Absolutely. But with him as a starter, the rotation becomes stronger and the bullpen is used less. All the Phillies starters are capable of going deep into games. If Moyer and Pedro were both in the rotation, that would take a toll on the bullpen because each of them may not go longer than five or six innings. Happ and Martinez looks a lot better than Martinez and Moyer with Happ in the bullpen. There are many options for the Phillies: a six man rotation, somebody could be moved the bullpen, somebody placed on the disabled list, or Moyer and Martinez share time as starters. 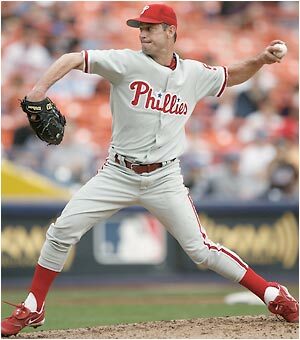 If the Phillies do what they should, Moyer should be the odd man out. They just need to decide what to do with him.